When I was working on Stitch by Stitch, I spent untold hours hunting for the very most perfect fabrics to showcase the projects. One night, in a rush of final decisions, I ordered yards and yards and yards of beautiful cottons to be delivered so that I could make the samples that made up the bulk of the book. 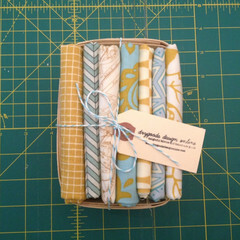 Days later, the boxes arrived, and I sifted through and chose a print here, a coordinate there, prepping for the sewing. I carefully packed my first picks and some alternates for the trip to my publisher’s to shoot the step-by-step photos for the book. When my editor and photographer and I were laying out the color story for the projects as a group, we finalized selections, and most of the fabrics I had ordered were lifted and rearranged and mixed and matched so much that I lost sight of which fabrics were from which designers and collections. After the book came out and I was planning the blog tour, I sent a note to Bari J, asking her to be part of the tour, since I knew I’d used some of her fabrics on a very popular project (the zippered piped pillow). And then I flipped through the book, because something was nagging at the back of my head. 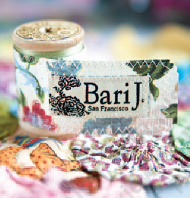 And there was the proof: I had used LOTS of Bari’s fabrics–a whole lot. Without even realizing it, I had selected no fewer than five of her prints to be featured prominently on three different projects, and all of them are absolutely lovely. So when Bari sent a note saying that her very first book is coming out and asking me to be part of her blog tour, I was more than pleased: I’m excited to see her style and sincerity come through in a new format, and can’t wait for those of you who don’t know her yet to meet her. I am happiest flipping through the book and seeing that the things that I admired in her fabric designs really translate to the pages of her book. I am especially drawn to Bari’s painterly sense of color and movement, and have loved that about her fabrics as each new collection is released. That same sense of spontaneity comes through in the book, which is packed to the gills with projects and ideas and insights, and yes: inspiration. Called Inspired to Sew, the book leads you through Bari’s own experiences with sewing in a way that I think is really personal and charming without trying too hard. She’s super approachable and friendly in her tone, and it’s clear that she’s Been There in a way that makes her like an older sister showing you the ropes. The book includes lots of instruction in different techniques, like freezer paper applique and free motion quilting, that newer stitchers have lots of questions about, and she offers it in a way that’s integrated into the projects so that you always feel as though you’re learning just what you want to learn when you want to learn it. The photography is lovely and soothing and soft and dreamy, and features Bari’s fabrics and her aesthetic in a way that makes me want to flip through the pages over and over just to imagine myself in a bright, sunny room with the ease of a day of dreaming ahead of me. I find the whole look of the book super relaxing and enjoyable and finding that satisfied place helps me to come up with new and exciting ideas–a pretty rare combination for a book that also includes clear writing and approachable projects. 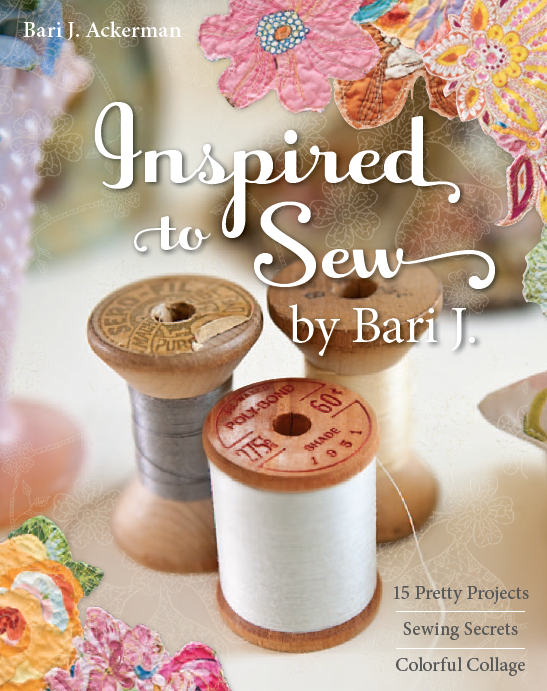 I love that there is such a wide variety of projects–Bari says that she began sewing simply to bring some beauty and creativity into her home and her life, and it’s clear that she’s written this book with the same philosophy and desire. Her warmth and clear pleasure in sewing come through, and you feel invited to try the techniques and projects she shows you. I hope it doesn’t sound super trite, but I truly think there is a project here for everyone. Bari has a long history of bag-making, so it’s no surprise that the bags are strong, well-rounded projects. 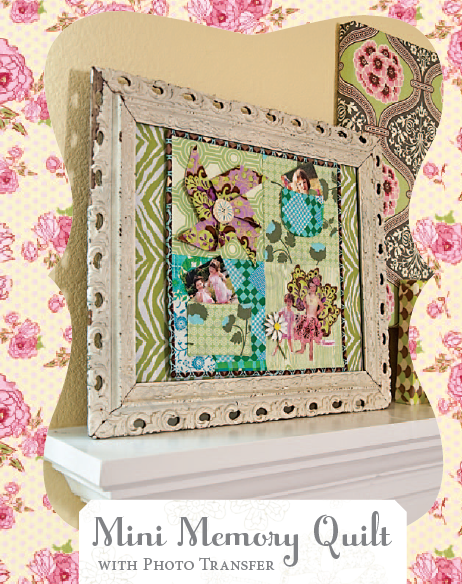 I personally am really fond of the home decor projects, and love the idea behind the keepsake memory quilt–Bari really does a great job of layering fabrics and threads and images into a frame-worthy piece of fabric art that makes me want to preserve my family’s memories in a format I’ve never tried before. 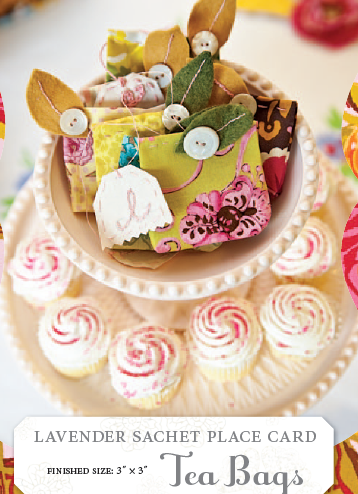 Stash Books, Bari’s publisher, is GIVING AWAY a copy of Inspired to Sew to one of you, and I think you’ll really enjoy skimming the pages and dreaming up ways to bring these projects into your sewing and your home. More than anything else, I think I was most touched that Bari doesn’t make me feel pressured to do exactly her project through her writing–instead, I felt like she’d presented some inspiring ideas and then given me permission to make them my own, use the techniques to give a little twist and bring a new concept to my sewing machine, where it would easily translate itself to my aesthetic and sensibilities. Totally expecting it to do the same for you! To enter to win a copy of Inspired to Sew, leave a comment and let me know the most inspiring sewing project you’ve ever seen. I’ll start: in Pittsburgh a few years ago, I saw a king sized yo-yo quilt that looked from far away as if it was made entirely of lace. It was amazing, and the very first time I have ever been stopped in my tracks by the beauty of a simple bed covering. What sewing has inspired you? Leave your comment by midnight February 14, and I’ll choose a winner to be announced on the blog next Tuesday, February 15. Oh how I would love to win this book. 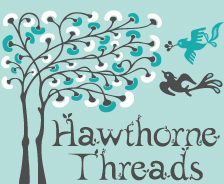 I am sew inspired by all the wonderful books, patterns, fabrics and blogs. Sewing connects us with so many wonderful people. Most inspiring sewing was attending an exhibit by Laurie Swim – Land, Sea and Memory. Amazing quilt artist!! I dream of my creativity translating that well someday. Watching some friends work on their applique, inspired me to take some classes to learn this technique. When looking at patterns, i wouldn’t even look at the applique ones until I started learning how to do this. Now I look at patterns in a whole new way. It’s hard to pick one; I find Rita’s quilts (at Red Pepper Quilts) truly amazing. I love how her wonderful sense of colour and the simplicity of her quilting. I’m inspired to sew by my future daughter-in-law who makes the most creative things whether using new or repurposed fabrics and embellishments. Bari J’s book would help me find some inspiration! I was inspired to make some traditional american quilts after visiting the underground railroad museum and looking at their quilts! I love the civil war quilts right now too. Thank you for the interesting book review and background on Bari and yourself. One of the most inspiring quilts I’ve seen is the quilt made by my great grandmother that was passed down to my late father. It is made of 4.5 inch blocks – hand pieced and hand quilted – tiny stars each with 24 pieces made in those 4.5 inch blocks. The colors are gorgeous. This quilt inspires me to make quilts. 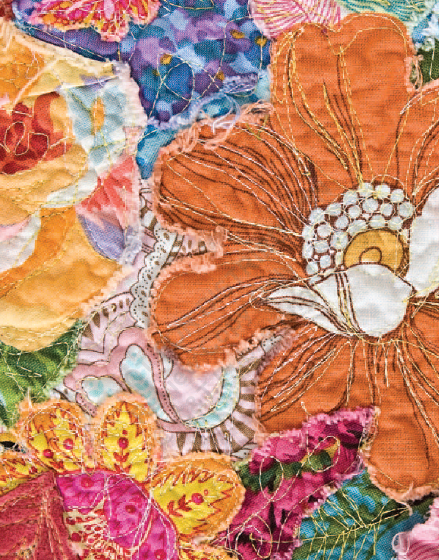 Bari’s book will inspire me too – as want to make some art quilts and her collages are lovely. Most inspiring sewing is a garment I have only seen in pictures. My grandmother sewed my mother’s wedding dress. I have a picture of my grandmother, looking refined and proud in her furcoat, standing next to my 19 year old mother, in her tealength lacey gathered dress, veil in the wind, taken in England in 1955. I have loved that dress since I was a little girl, always in awe that my grandmother could sew such a beautiful gown. After my grandmother passed away, I inherited one of her handmade quilts. She never worked outside the home, but would sell her quilts to bring in extra money the family needed. I spent a lot of time looking at those hand quilted stitches and thinking about her. The most inspiring project I can think of is the smocking that my mother did when I was young. My younger sister was born premature and was in the NICU for two months, and I remember my mother working on making two dresses – a christening gown for her and a spring dress to match for me – on those nights when she couldn’t be in the NICU. A few weeks back I saw a post from Artsy Crafty Babe. She had made a quilt for a child, who was in her sons class, whose lost his house to a fire. She had all the kids in his class draw pictures, which she then incorporated into the quilt. The outcome of the quilt was beyond words because of her selflessness, the art work of the children, and the fact that the quilt was going to be something the family who was receiving it could cherish. They would be able to see that others are willing to help in the ways they could. A yo yo quilt can be very inspiring. For me it as a Grandmothers Flower Garden. I loved the connection between the fabrics and the design. Have been quilting for almost 21 years because of that quilt. The most inspiring quilt I’ve ever seen was a paper pieced medallion quilt. It looked just like the floor tiles I had seen during a trip to Italy. At the time I was new to quilting and when I looked at that quilt I saw goals I wanted to set for myself as a quilter. The colors had been masterfully chosen to creat a 3D affect I want to be able to select colors in the same way. I also wanted to make a queen sized paper pieced quilt. A quilt that my grandmother had let me help her make and then she gave it to me! All the sewing was done by hand! Thanks for sharing and a chance to win! I had to stop and think for a moment on this. What inspires me is the randomness of quilts. Anything goes and yet they still come out beautiful because someone’s hand made that. Not a big factory pumping them out but a personal hand touched a quilt. That I love. It’s not very unique and exciting, but I’m so inspired by a little baby dress I found at a thrift store for 50 cents. It must be very old, the fabric is worn thin and faded. It has a peter pan collar and about a zillion layers of ruffles. Since it’s much too little and worn for my daughter, I intended to take it apart and use the pieces as a pattern to recreate the dress. But I just can’t bear to take it apart! So it hangs in my craft room, just looking pretty. I am a new follower of your blog, I have your book but I hadn’t realised you wrote it! D’oh! My mum made me a belly dancer costume when I was about ten. I truly though it was the most beautiful thing in the world ever. She stopped making me things when she went back to work but the memory of that costume lives on! I’M INSPIRED BY EVERYONE ELSE’S FREE MOTION STITCHING! i JUST DON’T QUITE HAVE THAT DOWN YES=BUT I’LL KEEP PRACTICING! ” WHERE THERE’S A WILL, THERE’S A WAY”! The most inspiring sewing for me was a really just a simple picnic placemat I made in your Intro to Sewing class a few years ago (and in Stitch by Stitch). That and the rest of the class gave me the confidence to believe I could make more lovely, functional, interesting things — that I had the skills to make whatever I wanted — which I now do. From thence a sewing obsession was born! The most inspiring quilt I’ve ever seen (a picture) of was a wall art/quilt of a hand-painted angel. The most incredible thing about it is that it was pieced and hand-quilted first, and then painted. Can you imagine? It must have been nerve-wracking, to think of all the work that was done, and might be ruined if the painting went wrong. But it was stunningly gorgeous and I wish I had the courage to plan and do a project like that. I got inspired by refashioning children’s clothes. Never saw it before and now love it! I saw online the most fantastic fabric advent calendar. Each pocket contained a sewn felt decoration that could be hung on the appliqued ‘tree’ above. It was totally amazing. I dream of making something so beautiful, whimsical, and lovely. Two years ago I saw a Car Cozy an online blogger made and thought “How Cute!” The tutorial wasn’t created yet, so I worked backwards from the finished dimensions and made one. It also inspired me to start making more fun things for my kids. The most inspired sewing I have ever observed has to be from about 45 years ago when my mother saw a dress in a downtown store window, came home and made THE DRESS in some wispy aqua fabric. It was the prettiest thing I had ever seen and, even at age 7, I somehow understood that it was a big deal that she had made it without a pattern! I’ve never been able to do that. i was inspired to learn to sew by the barbie doll clothes my mother made for my sisters and I. So tiny and detailed! Our dolls had the best wardrobe….coats, suits, ball gowns, swimsuits. I am inspired to sew my by grandmother and her beautiful projects. I have her old Kenmore machine. She passed about 10 years ago and I recently brought out her machine and have been using it. Every time I turn it on and stitch something I think of her and remember her using this machine, its like a connection with her that will never go away. Thanks for your blog! I enjoy reading it! The most incredible project I’ve seen (not in real life though!) is Jodie’s (RicRac) selvedge dress – I’ve been saving selvedges ever since!!! My Aunt inspires me every time i see her lovely quilts. I want to learn how to quilt too! Bari’s work has inspired me. I first saw her in an issue of Quilts & More and had to search online to find her. I’ve been following her blog since then. I finally was able to buy some of her gorgeous fabric. I’m now waiting to get my hands on the book and get brave enough to cut it! I’ve been a sewer for many years, but the whole quilting side of things is new. Bari’s work and others I’ve found online have really inspired me to try this new side of sewing! It was a mariner’s compass that had about 16 different compass blocks made with blues and violets and greens. So striking!! When I was 5, my mother and grandmother made me a dinosaur costume for Halloween. It was awesome. I’m not really sure why I wanted to be a dinosaur, but I loved that costume. It really inspires me to make things for my kids. The most amazing thing I have ever seen is a quilt that had a 3D sewing machine one, with swirls of different stitches coming out and around it. It was so colourful and I love it! This book looks amazing! I was at church a couple of weeks ago and saw a little girl that had an adorable dress on. I knew that I was going to whip up my own pattern similar to the dress I saw – I have the fabric, now if I could just find the time! My mom’s sewing has been what’s inspired me most. She’s truly an incredible seamstress, and I would love to be able to make what she can out of fabric—anything! It’d be hard to pick a favorite article she’s made, but one of my favorites was the dress she made me for my wedding open house. It was just beautiful! I get compliments on it all the time. As a teenager my quilting/sewing journey began at a quilt fair where there was the most amazing (and huge) quilt made to look like an enormous photo of R.M. Williams. From a distance you could swear it was a photo, but up close it was loads of tiny little pieces put together to form the picture! Incredible!! My biggest inspiration is my mom. She sewed her own wedding dress and the three bridesmaid dresses as well. During college, she didn’t have a machine, so she hand sewed wool suits and blouses for herself. The workmanship was impeccable! She is the little voice in my head that makes me want to try my best at whatever I’m doing. Thanks, Mom. I have been a hand stitcher for years and went to a quilting show in Birmingham, U.K., and just gawked at everything I saw because it was all so beautiful and I had been monkeying around with fabrics for a few years just using them to finish my stitching things. So now I’m using it to quilt – badly, I mean really badly but I’ll get better. I’m determined to get better at it and I really NEED Bari’s book to help me. Thank you so much for the chance to win it. The item I gained most inspiration from would be the patchwork eiderdown that used to live on my grandma’s guest bed. I used to love examining all the different fabrics and making up stories. The lady who stitched it, my grandma, is my biggest inspiration for all the love she put into all the crafting she used to do. 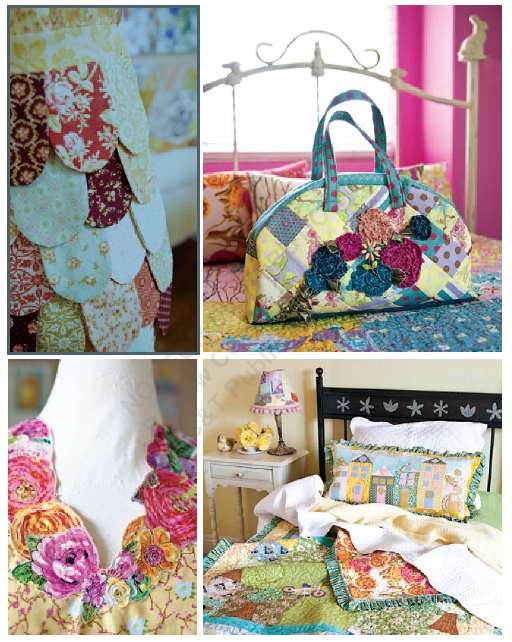 My latest inspiration is Bari’s Garden Tea Party Quilt. I love the collaged border!! I am using that effect on a beautiful bag which I have in the planning stage! What fun!! I was inspired and moved by the Aids Memorial Quilt when it came to my college. Coming from a quilting family in the Appalachian mountains, I had never seen quilting used in this way and I have never forgotten that experience. Mmmm, hard to pick just one. So much inspiration in the real world and in blogland. But on a recent hooliday hubby and I did the Tahuna Airwalk, south of Hobart, Tasmania, Australia. In the lobby was a gorgeous textile work of creatures and flowers and forests and, and, and. It’s beauty could not be captured by a photo but it was hard to walk away from. Both of my grandmothers were quilters, and the piece of sewing that inspires me most is the quilt they made for my. Gra’mom pieced it by hand with her perfectly uniform, tiny stitches, and Granny quilted it, also by hand with her also perfectly uniform, tiny stitches! It is so very beautiful and inspiring! I remember a quilt in a West Coast quilt show, I think it was titled “The Sea Captain’s Wife” and it was gorgeous and very inspiring. Thanks for the great giveaway. I have been inspired by my children’s christening gowns – which my mom made from my wedding dress. She did a fabulous job and they were so meaningful to us! I’ve been inspired by a woman that I attend church with. She has always been willing to make the ladies and the little girls of the church denim skirts. She always does it for free, and I always love the creative ideas she comes up with. The best thing though is her face when she hands over a new skirt! You can always tell she loves making the skirt, and she loves being able to put a smile on others faces. I am inspired to sew by Maryy on Burdastyle, I love her designs! While in Northern Indiana, we were able to see the Quilt garden tour, and some beautiful quilt art – I was just starting to sew, and it really made a point of what could be done – there was a lovely quilt by an artist of blue herons, and the other, more traditional patterns. I was given an old quilt from the 1930’s last year, and it’s just beautiful. Hand pieced, of course, and seems to be a variation of a grandmother’s fan but is scalloped like dresden plates and also split down the middle of each blade. It’s simply beautiful, and amazing. This year, i decided to start some hand-piecing of my own. this means machine projects have slowed, but I’m going to have one awesome Kindle cover when I’m done! I opened a magazine to find the most beautiful denim red poppy quilt. I purchased all the fabric and then I met the designer. what a huge treat!!! I love going to quilt shows to see the entries in person. There are lots of photos of beautiful quilts in blogland, but seeing the real quilt and the beauty of the work is very inspiring. I have to honestly say what has inspired me the most to sew is a queen sized scrappy quilt I remember as a very young girl that was sewn and quilted by the hands of a very sweet elderly lady and gifted to my mother … just because. She probably had the most arthritic knuckles, and the most hunched over back, anyone would ever see but this quilt was patched with 2 inch squares and to this day I’m always amazed that this wonderful lady made such a project. To me, that’s inspiring. The most inspiring quilt I ever saw was at the annual quilt show in Portland, Oregon. A woman, late in life, had appliqued a quilt that told the story of her life. It covered her childhood, marriage, raising children, welcoming grandchildren, expressing herself creatively, losing her husband, and conveyed that even after her husband passed, life went on as her grandchildren grew and went out into the world. So touching, so beautifully rendered. Awe-inspiring. As an adult I’ve dabbled in sewing, but it hasn’t been until my late 20s that it really blossomed. A few years ago, my mom took me to my first quilt show. They showcased all these artist quilts. I must have wandered through those 2 rows for upwards of 2 hours. I couldn’t even wrap my mind around how some of these people created almost paintings with fabric! To this day, my background is a nifty rainbow hued quilt that I adored. I get inspired everytime I look through a magazine or a blog or show and tell at my quilt guild. I loved a cathedral window quilt I saw once. It was just amazing, and I can still picture it today. The piece that jumps immediately to mind is one that you showed us in the Beginning Sewing class–that dress made entirely out of strips of selvedge. I can’t remember whose blog it was on, but it was AMAZING. One of the most exciting projects to see was a fat quarter quilt at my quilting class. I’m new to quilting and quite intimidated…but seeing this quilt helped me to feel confident that I too can do that someday! I think I have been inspired by so many things but first is my mothers embroidery in particular a hoop embroiderey of Australian Native flowers in Silk ribbon which was a birthday gift to me almost 15 years ago now. It hangs on my loungeroom wall to remind me of what is possible if I put my mind to it and let myself express the beauty I see. I was most inspired by an Iris quilt my grandmother made. She inspired my love of sewing and I treasure the Voque sewing book she gave me many many years ago! There are so many I’ve been inspired by. I picked up a holey, ripped up vintage quilt at a thrifty kind of place. It had all these neat vintage fabrics in it, along with a bunch of newer ones where they had tried to repair it. I keep it in my car for no other reason than I just like it, it reminds me to care about where things came from. It sounds silly as I write it so I’m not sure I’m wording it properly. Sewing projects that first inspired me to sew are still what inspire me today: my great-grandmother’s quilts. Two of my favorites are the all-corduroy patchwork quilt and her cathedral window quilt. Every stitch was done by hand, making them all the more special. This book looks like so much fun! Very inspirational, just like the title says! Where do I find inspiration? Books! I’ve always been a huge reader and collector of books, and guess what, ended up marrying a librarian, only furthering the flow of books in my life. One of my favorites is Kaffe Fassett’s Glorious Inspiration, full of textiles, porcelain, paintings and other art from London’s Victoria & Albert Museum. It’s a constant source of colour ideas, details and schemes! I find I’m at my most creative when I’ve spent an hour or so pouring over books or the internet looking at inspiring images then I head out for a hike in the snow or arid summer desert around us. The exertion combined with the calm tones of the familiar landscape really helps crystalize ideas. Plus it stops the dog from whining! My great grandmother’s crazy patchwork quilt! It is about 150 years old! All the fabric pieces, whether silk, velvet or cotton, were from the inside of men’s coats, hats, and dresses. In addition, all the seam lines were hand embroidered with different stitches. Also, there are several initials of family members. It is so old and fragile that it cannot be used. My mother, about 50 years ago, put a new backing on the quilt hoping to hold its shape somewhat. I would love to think of something to do with this amazing quilt. This book looks incredible for inspiration! That is how I am inspired by leafing through magazines and books. Thanks! My first quilt ever was inspired by a t-shirt quilt I saw in a magazine. I made one for my son using his old t-shirts and jeans. Quite an undertaking for someone who had never sewn before! I’m also incredibly inspired by the quilting by Ivory Spring: http://ivoryspring.wordpress.com . I can’t get over the fact that she quilts on a regular machine! It has to be the silk pyjamas made by my Grandma that have found their way to me. 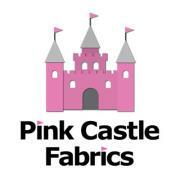 They are a beautiful pale pink, hand sewn and embroidered. Must be about 60 years old and obviously very frail so they don’t come out much but nevertheless they are an amazing example of skill and talent. I would love to win this book. The most inspirational project I have ever seen….wow…that’s a hard question. I think it would have to be a huge antique Lemoyne star quilt that was for sale in an antique shop. It had a bit of damage on it, but all the diamonds were perfectly hand stitched. The quality of the fabric was amazing. Every single point met perfectly. The quilting was done in a fan and the stitches were so tiny, you could barely see them. It was a stunning quilt. It just amazed me to see this masterpiece all done by hand. There was no background information about who had made it. But it had to be a master quilter. Love it. It made me want to quilt that much more, so that I could be that good someday too. I was able to see and actually touch a quilt made by Ted Storm, from the Netherlands. She won first place at the Paducah quilt show a few years ago and then there was a showing of the quilt in a private home in Ohio that I was priveledged to attend. I just couldn’t take my eyes off of the quilt and her quilting. 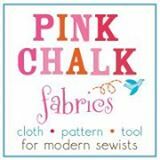 There are so many fabulous patterns, books and most of all fabric. I just can’t get enough of them all. Thanks for this great chance to win!!! Every time I look at the little dress and fully lined velvet coat and hat that my *very* young mother made for me the Christmas I was 14 months old I am just amazed – her craftsmanship has been the goal I have been inspired by for practically my entire life. Oh and my own daughter looked beyond amazing in that same outfit last Christmas! The first really inspirational quilts for me were when I saw Ellen Ann Eddy on Simply Quilts. Her thread painting is amazing. I was lucky enough to later get to take one of her classes. That book looks just amazing!! Would love to win a copy. My sister-in-law is a fantastic crafter. She made a little quilt with dinosaurs for my nephew which was absolutely stunning – and totally inspiring! blogs inspired me. The sharing and communicating is just unbelievable. Two things have inspired me to sew. My Mom, and the never ending palette of new fabrics. Like Darcy, my earliest memories were of my mother sitting at her Singer (which she still uses some 50 years later) making pretty things for her small daughters. It featured embroidery stitches! This was long before electronic machines. We had to insert black plastic cams to change the stitch patterns. I learned to sew on that machine. And the act of walking into a fabric store gets my creative juices flowing, whether it was the basement fabric department of the rural Ben Franklin store where we purchased the cotton broadcloth for my first Home Economics project (for about $1.79 a yard) to the Pendleton Wools carried by the Amluxens Fabric store In Downtown Minneapolis in the early ’70s to the quilt shops and craft stores of today. Each new collection reflects not ony the fresh new color palettes of today, but pays homage to the generations of artists, (although they never considered themselves such) that have gone before. When I was a young girl my Grandmother taught me how to sew and she also sat with me through my first viewing of Gone With the Wind. I was entranced by the clothes and the fact that Scarlett put together that velvet green dress from curtains!! That was so inspiring to me and every time I watch that movie..still..I get inspired by the clothes. I took a quilting class this past fall & just watching the teacher sew things was so inspiring to me. I went from feeling completely inept with my machine to feeling quite confident in my own ability. I love seeing old, worn, antique quilts. They are so beautiful and show such great love. Most were made out of necessity and are so inspiring! My younger sister made my senior prom gown when she was 15 years old. I have to tell you that I felt like a princess in it. The gown was very impressive and I could not have been happier. Over the years, I often think about that gown and how little time it took for my sister to make it. She is my creative guru. I would not be sewing today if it were not for her. A dress that my mom made for me to wear for my first grade picture was the inspiration to start sewing for my girls! I remember how very proud I was of the dress and loved all the compliments the teachers gave me when I was wearing this dress. I wanted my girls to feel that. Yet the feelings I had of my girls wearing something I made caused me to be even more inspired!! Thanks for the giveaway! Many years ago, long before I ever started quilting, I saw a picture in a craft magazine (probably McCall’s Needlework and Crafts) that had a gorgeous cathedral window quilt in it. I was in awe that someone could do that. I had no idea how it was done, but I thought it was so beautiful that it has stayed with me all these years. And I still haven’t made one for myself yet, but I will. There is so much that is inspiring out there, but my most recent ‘find’ are the scenes created from denim at http://denimu.com/page4.htm I am absolutely in awe of these works!! The most inspiring sewing craft I saw, was actually a month ago. It is a patriotic quilt. I am now taking the class to make it and am making two! love to have that book, looks wonderful, very pretty pictures. I have been inspired over the years by the many antique quilts I have seen at quilt shows. The amazing things that were made using such humble fabrics and tools blow me away! I was inspired to quilt by my friend, Kim. Previously, I think I thought that quilting was old-fashioned, or just not for me. But my friend kept at me about it, and after seeing all the beautiful things that she was making with the same modern fabrics that we both loved, I put my toe in the water and haven’t looked back since! I love the inspiration to use quilting to enhance the design of the fabric! It’s beautiful. I participated in a quilt round robin years ago. Absolutely gorgeous – it inspired me to no end, because everyone’s work went so well with it. It went through Katrina, and I still have it, but it’s so damaged I’m afraid to open it up again. I think it’s one of the prettiest I’ve ever seen! The most inspiring sewing item I’ve seen was a quilt that was sent to us for our wedding by my husband’s aunt in West Virginia. She quilted almost every day and made quilts for everyone. I didn’t realize it was sewn by hand until many years later when I started to quilt. We’ve “loved” that quilt to death! She’s gone now, but we still have her talent to remember her by. too fun. I think the most inspired project I’ve seen is not what I would have chosen for myself – but it was a HUGE scrap quilt all made out of polyester fabric. The person who had it said her grandmother made it out of all her leftover fabrics – WHO has that much LEFTOVER polyester ala 1972? Every cathedral windows quilt is absolutely awe inspiring in my book. But the baby garments and blankets that my great grandmothers and grandmothers made have inspired me the most. Oh that’s so tough! One project that really stuck in my mind was that dress made out of selvedges, I can’t remember who it was that made it. I don’t want to make one myself, but the idea that someone was thinking so far outside the box as that really inspired me. I saw a quilt at a quilt show. It looked like a stacked stone wall, the kind you see in ancient ruins in the desert southwest. I liked it enough to take it’s picture. When I got home and transferred the photo to my computer I gasped. It looked like a real wall- unbelievable. I couldn’t convince my sewing friends it was a quilt. It was beautiful! I was totally inspired to start quilting again (after a long hiatus) by a visit to a quilt store in Atlanta in 2007. I have to return now that I see Whipstitch has a bricks and mortar store! After 10 years away from sewing, I was stunned to see fabric from Kaffe Fasset, Amy Butler, and of course now Bari J – it totally appeals to my colour aesthetic. I been sewing for a long time…inspired as a little girl by my grandmother and mom. 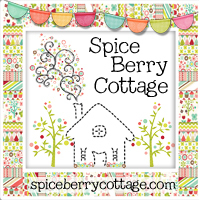 Now I quilt and most of my inspiration comes from the creative quilty bloggers from all over the world. Thanks for a chance to win this book of inspiration! Honestly, I can’t think of that one project, but I do have an inspirational random story! Back in high school (aka 1996-97) I can remember seeing “Clueless” for the first time, and loving all of the clothing and thinking, why can’t I find stuff like that in the store…wait I can make it myself, and that movie is what inspired me to make more of my own clothing! Funny, isn’t it, go ahead and laugh, I am! I’ve loved sewing and creating since I was little. Both of my grandmothers sewed and I like to think I’m carrying on their legacy. I smocked and sewed lots of dresses for our daughter and now I get to create for our grandgirl who is almost 2. Still having a ball! Stumped! Lately I know I’ve been blown away by the applique with embroidery that I’ve seen. I’m an applique newbie but I am inspired! Thanks so much for a chance to win this book. Deborah, this book looks fabulous! I’d love the chance to own a copy. And thanks so much for the thorough and thoughtful review (not that I’m surprised in the least). Even if I don’t win, I now know that I need to buy myself a copy. Some of the most inspiring projects I’ve ever seen (though not in person) are the mixed-media quilt paintings by Jen Swearington. It’s amazing to me that she can transform tired old bedsheets into these amazing works of art that tell stories that are at once haunting and whimsical. I am a new quilter I didn’t think I would be able to quilt. I looked on the internet and saw what other people were doing and so loved what I saw I decided to give it a go. I now love it, I am inspired every day to try something new, thanks to the other bloggers out there. Thanks for a chance to win. The most inspiring…that’s hard. There is a japanese quilt from a quilting book I got on sale several years ago that always makes me want to start up the Bernina, though. It’s made with silk and features swirling apricot and cream colored petals that I love. I saw a scrappy strip quilt once that totally inspired me. I love scrappy quilts!!! I’ve been perusing art quilts online lately as I’m working on my first, and I’ve been amazed by what’s out there…particularly ones that are so intricate that they almost look like the quilt has been painted, not appliqued….amazing! Most inspiring? Oh gosh, I don’t know. I just commented on another blog that my brain runs on inspiration. Everything inspires me. Colors, plants, buildings, photographs, looking into a room at a different angle than normal. Inspiration is EVERYWHERE!! If only I could dump all of that into a sewing machine…and a fabric maker…and an ebroidery machine…and a serger…I would rule the world!